Sign up and receive Property Email Alerts of Offices to let in Bryanston, Bryanston. 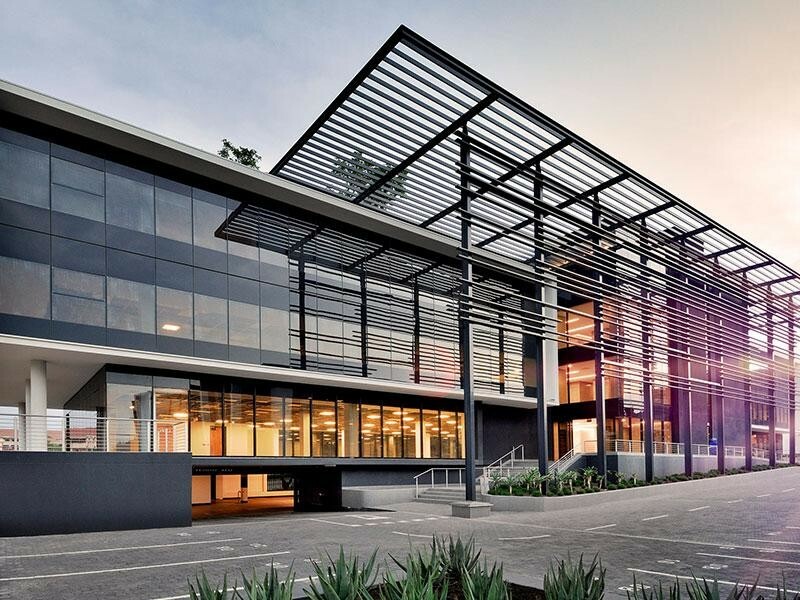 Knightsbridge Development is a redevelopment office park, based in Bryanston, Johannesburg.This prime located office development will boast 29,352sqm in terms of GLA office space.The Knightsbridge development, located in Sloane Street opposite the Didata Campus, started in November 2015 and the first of seven new buildings is set to be complete by May 2017. The new Knightsbridge is going to be a P-grade, resource-efficient and green rated office complex and the entire office park is designed to achieve a 4-Star Green Star SA rating. By applying innovative technology and design methodologies we can help minimise the buildings carbon footprint. Bryanston is a growing business hub, therefore, Knightsbridge development responds to the great demand for offices in the area. The layout and design of Knightsbridge development is built around the idea of a central urban park where buildings are placed within a dense urban forest. Running tracks and outdoor relaxations spaces are provided within the urban forest. Knightsbridge development aims to increase the variety of organisms present in the urban ecosystem without impairing human usage of the landscape. When its comes to the interior of the offices at Knightsbridge development, these buildings will be defined by quality design, materials and finishes, and will feature standby generators and back-up water supply. This will be complemented by resource-efficient state-of-the-art mechanical and electrical installations including a chilled water system, lighting sensors, access control, CCTV and rainwater harvesting for irrigation. You can expect the office lifestyle at Knightsbridge development to be unlike any other! Tenants are offered a new type of office lifestyle, with a centrally located restaurant with boardroom facilities, roof gardens and entertainment spaces and various outdoor office spaces that will enhance the experience of the user. Security at Knightsbridge development will be top notch. Site access control and perimeter security features will create an office park with a safe primary public zone. Each individual building will have their own access control and security line according to tenant requirements. We look forward to when Knightsbridge development reaches its completion, to welcome you into a safe and secure business lifestyle! At Malherbex Property Group we endeavour to give you the most holistic commercial leasing advice. Contact us today to speak to one of our area specialists at 0652-000-000. Sign-up and receive Property Email Alerts of Offices to let in Bryanston, Bryanston. Disclaimer: While every effort will be made to ensure that the information contained within the Malherbex website is accurate and up to date, Malherbex makes no warranty, representation or undertaking whether expressed or implied, nor do we assume any legal liability, whether direct or indirect, or responsibility for the accuracy, completeness, or usefulness of any information. Prospective purchasers and tenants should make their own enquiries to verify the information contained herein.